..only when I moved to Manchester was I told of my incorrect grammar. But back in Norfolk I could say without note that my sister shew me, along the river Wensum, things I’d not seen before. My sister, having now lived there longer than me, walked me through the city along the river with its huge weeping willows and shew me the old pump house near Barn Road, some good public art – it looks like it belongs there – on the Quay side and a parasitic birds house in a tree beside Cow Tower. She shew me the Jarrolds Printing museum, only open on Wednesdays ( it was a thursday) and a new bridge – rusty metal and wood..mmmm near Pulls Ferry. We walked over to see parts of the old city walls, out past the football grounds and Carrow Bridge House, tucked away up the side of a hill. She says they reckon parts of the wall were taken as raw materials, built in and around. People are living with the wall in their homes today and might not even know they have a lookout post in the attic, flint arrowheads in the cellar. We also walked into Surrey House the Norwich Union building that took up all the marble Westminster Abbey couldn’t afford, lining almost every surface with it. We saw an early air conditioning system and a gold and green skeleton clock made for the Great Exhibition. The clock played 12 tunes, 1 for every hour, the workers disabled it as they couldn’t get enough work done, unable to resist the urge to waltz the marble floors whenever the chime called them. I’m going to be showing work at the Glasgow Artists Book Fair this weekend (28th and 29th April). Most of the books on my website will be there for perusal and purchase including the ‘proper’ half of the -in between- edition, on sale for a princely £4.50 each. I’m really looking forward to having a mooch about Glasgow again, I might drop the last few misfits whilst I mooch. Next week, as part of the current exhibition at BLANKSPACE, I’ll be running a workshop with writer Annie Clarkson. See below for details. Spend the afternoon responding to work and themes from the exhibition with poet Annie Clarkson and visual artist Gemma Lacey. Sharing with you experiences of their own working collaborations the artists will facilitate discussion, writing and making using some of their own creative play as starting points for creating new work. To book your place please email Nathalie. 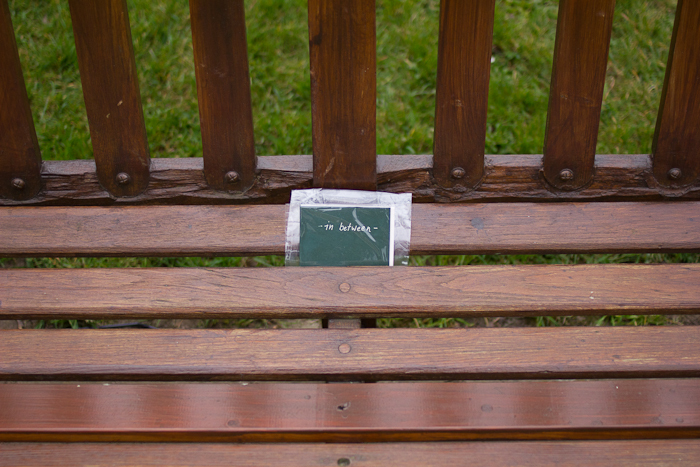 …this time dropped on a park bench in the beautiful Berkshire village of Waltham St Lawrence.Once again thanks to Matt for dropping and Sarah for shooting.